Aerial view of Dionisio Point where archaeologists are examining why nomads in the area settled into village life. Many archaeologists believe humans first migrated to North America over the Bering Strait 15,000-to-18,000 years ago. They lived a nomadic lifestyle of hunting and gathering. Then, starting about 2,000 years ago, some of them settled in large, permanent villages. 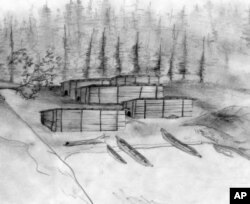 An on-going excavation to find out why this fundamental transformation occurred has archaeologists focusing on an ethnographic group in the Pacific Northwest called the Coast Salish people. The skyscrapers of Vancouver, Canada twinkle across the water while tall Douglas firs shade the excavation squares and sifting stations as researchers from Washington State University and the University of British Columbia kneel in pits, carefully scraping away with trowel or brush. At Dionisio Point Provincial Park on Galiano Island in British Columbia, WSU archaeologist Colin Grier leads a 10-member crew probing what he considers one of the best preserved early village sites of the Coast Salish people. Grier hopes this place can answer a burning question about what caused previously nomadic bands to advance into a more complex society. 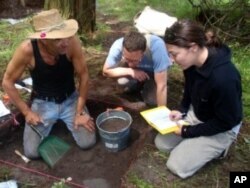 Colin Grier (center) discusses a find with graduate students Chris Arnett (left) and Kelly Derr (right). "Why did the transformation happen when it happened? That's probably the most difficult question to answer," says Grier. "When do people start to settle down?" In many parts of the world, the rise of village life is associated with the introduction of farming. "But of course, here no one invented agriculture," says Grier. Instead, the Salish people relied on fish, clams, game and wild plants. The archaeologists have identified the ruins of six big, ancient houses which form two neighboring beachfront villages. The largest of the buildings could shelter eight to 10 families. Based on radiocarbon dating, they were occupied around 1,500 years ago. Grier's team can infer economic changes from the variety of shells and animal and fish bones in the refuse piles outside doorways. "With a settled village life, you have to bring the food to you," he says. "So the diversity of resources in these village sites is very high." Other evidence of the transition to a more complex society includes trappings of wealth and a social class system. Grier catalogs some of what they've found. "A cache of 5,000 slate beads, some labrets, which are actually plugs that get inserted through the lip, that were status markers." Still, there's that nagging question of what caused these people to settle down and adopt customs that vaguely resemble some of ours today. One theory is that population pressure triggered the change. Grier isn't sure that's it, but he's finding evidence that seems to suggest that. "When settlement gets dense on a landscape, you have to create more food for people to eat. You have to intensify," he says. "So you have to reorganize a lot of what you do to feed more mouths." The researchers consult closely with the local Indian tribe. Penelakut tribal member Robert Sam, who believes ancestors of his lived in the village, supports the excavation. "It is really interesting to me to see the work that is being done," says Sam. "It shows more of where we were, all the sites that need to be catalogued for our people, our younger generation." Like other tribes, the Penelakut are sensitive about excavations which could disturb human remains. But Sam says there’s little risk of that while digging amongst the old longhouses, since the ancestral burial grounds were outside the village. Grier has worked here off and on since 1997, and says the ancient tribal village is slowly giving up its secrets. He has funding for two more summer seasons, and hopes that will be enough time to get to the bottom of the story.